Professor John Anthony Pickett, CBE, DSc, FRS, is listed in Debrett’s “People of Today” as a Distinguished Research Fellow and Head of Biological Chemistry with Rothamsted Research in Harpenden, Hertfordshire. However, getting down to earth, his “Recreation” is listed as “jazz trumpet playing”. But John is no ordinary trumpet player. 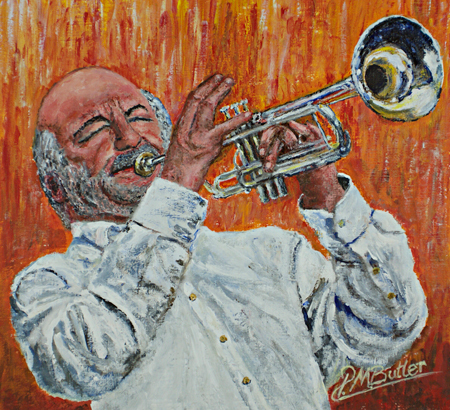 To match all his other achievements, he is a trumpet player extraordinaire and that’s all that matters to jazz fans. So I was highly privileged when he commissioned me to paint his jazz portrait. 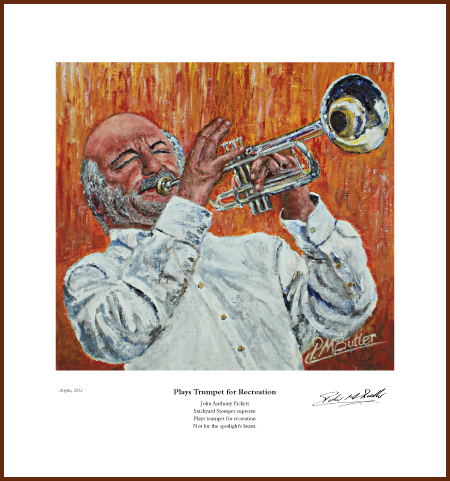 And of course it had to be a jazz painting of him on his beloved trumpet in his own inimitable virtuoso style with “Christine & The Stackyard Stompers”. Not for the spotlight’s beam. I write a poem to adorn each of my fine art prints of jazz musician portraits and in John’s case I simply couldn’t resist drawing on his DeBrett’s entry for my inspiration and reaching from his lofty levels of biological research to his safety valve of down to earth, traditional jazz.